Mrs Sparsit is referred to as a ‘Griffin’ by Harthouse’. (3ii). Old money, minor aristocracy pretensions are being satirised in this portrait: here we have the old ruling class on its uppers; for instance, we read of a physically frail, idle, decadent and spiteful woman meeting with the undignified experience of being ‘crammed’ (3iii) into a coach. She is ‘much dejected by the immorality of the people.’ and their ‘impiety’ (1xi) and it is her staircase (2x) that Louisa descends: rather than being applled, Mrs Sparsit ironically and perversely ‘exalted hugely’ (2xi) at this turn of events. She brings Mrs Pegler ‘in an ecstacy of excitement’ (3v) which becomes her undoing. She proudly declaims that her great aunt, with the ironically absurd name of Mrs Scadgers, is claimed to be ‘a Powler’ (1vii), on her mother’s side – as if that distant connection were of any worth. Her ‘Coriolanian style of nose’ (1vii) is elsewhere derogatively described as a ‘hook nose’ (2xi), and such Roman features as ‘Corolanian eyebrows’ (1xi) (2ix) (3ix) symbolise pride. She is said to make them ‘more Roman’ and ‘more Coriolanian’ (2i) when she is severe. When crossed, speak speaks ‘majestically’ (3ix), but she is normally obsequiously humble in her pride e.g. drawing back her chair, saying, ‘Your fireside, sir’ (1xvi). She speaks to Bounderby ‘with such great condescension’ and ‘such great compassion’ in ‘a highly superior manner’, on hearing of his marriage (1xvi) and ‘majestically’ (3ix). 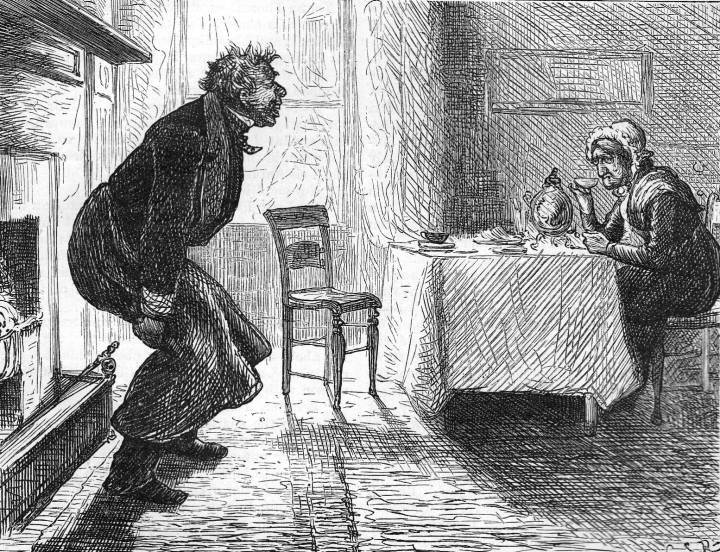 Dickens binds her to Bounderby in a structural household, tour de force of inflexible intemperance which is antithetically placed against the modest characters of Rachael, Sissy, Louisa and Stephen Blackpool. Bounderby makes Mrs Sparsit his ‘foil’(1vii) – note his image of ‘Down feathers’ versus ‘paving stone’ (1vii). However, she has ‘acrimony and contempt’ (2x) for him, calling him a ‘Noodle’, later giving him the ‘darkest scorn’ and sweeping past him ‘disdainfully’ (3ix). Her triumphant ‘Come out, Ma’am … or we’ll have you dragged in’ (3v) leads to her ‘favorite feature’ being described as ‘officious’ (3v) and her final satisfying come-uppance.